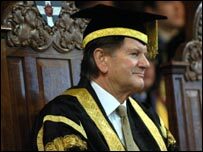 John Madejski, 66, was also made an Honorary Doctor of Letters and presided over his first graduation ceremony. The Premiership club chairman said he was "honoured", adding that it comes at a time when Reading has been identified as "the number one economic performer". "We can be proud of this and also our university which provides students from the UK and across the world the opportunity to study in a fantastic environment at this leading centre for higher education." The installation - the most formal event in the university's calendar - saw Lord Carrington, who became the sixth chancellor in March 1992, formally hand over the reigns with a handshake. It is the latest honour for Mr Madejski, who was appointed OBE in 2000 and was made freeman of the town after leading his team, nicknamed the Royals, to the Premiership for the first time in their 135-year history. Mr Madejski who took over as club chairman in 1990, is also a benefactor of the Royal Academy of Arts and has a gallery named after him at the Museum of Reading. He is also the Deputy Lord Lieutenant of Berkshire.